Gov. 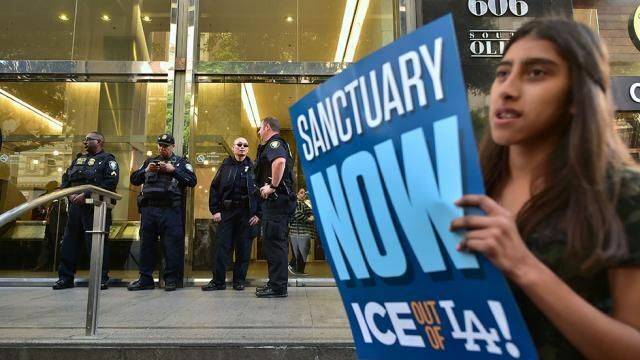 Jerry Brown and Senate President Pro Tem Kevin de León, D-Los Angeles, reached a compromise on the state’s “sanctuary state” bill this week, in a deal that amends the legislation to expand the ability of law enforcement to cooperate with federal authorities. The amended Senate Bill 54 “prevents our state and local law enforcement resources from being diverted to tear families apart. California will protect our communities from the Trump administration’s radical and hateful immigration policy agenda,” de León said in a statement. As part of the compromise, under the revised SB54, police can share information with federal authorities about inmates convicted of hundreds of crimes that were not part of the original language. These crimes include serious or violent felonies, felony drunk driving, unlawful possession of a deadly weapon and felony drug crimes. But the bill still prohibits law enforcement from inquiring as to a person’s immigration status, detaining suspected illegal immigrants for ICE, and from acting as federal immigration agents. “This bill protects public safety and people who come to California to work hard and make this state a better place,” Gov. Brown’s statement read. Under the amendment, federal agents will be permitted to interview suspected illegal aliens in jails and to access state databases – actions that were previously prohibited. 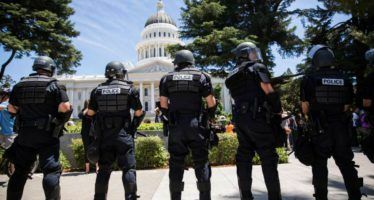 The California Sheriffs Association still opposes the bill, despite the changes, believing it puts too great of a barrier between local enforcement and federal authorities. Activists on the left largely praised the agreement. Pablo Alvarado, executive director of the National Day Laborer Organizing Network, called the deal a “victory for migrants,” according to the Sacramento Bee. The bill must still be passed by the state Assembly. SB54 comes amid a larger national debate about “sanctuary” policies, with conservatives and many law enforcement groups maintaining that they provide a safe haven for violate criminal aliens, while liberals and immigration activists argue the so-called “sanctuaries” encourage undocumented aliens to cooperate with police without fear of deportation. The bill could also be a model for other states eager to push back against the Trump administration’s immigration crackdown. For California, it’s just the latest act of defiance against the Trump agenda in Washington, as Attorney General Xavier Becerra on Monday sued the administration over its decision to rescind the Obama-era Deferred Action for Childhood Arrivals, arguing that doing away with the order violates the Fifth Amendment’s Due Process Clause, citing fears that the administration may use “Dreamer” data to find and deport them. However, President Trump has said there will be “no action” to that effect for six months as Congress attempts to craft a legislative fix. “I think everyone recognizes the scope and breadth of the Trump decision to terminate DACA hits hardest here,” Becerra said. About one quarter of the 800,000 recipients of DACA live in the Golden State. Jesus hated the poor and downtrodden, right? I’m sure you’d be just as welcome in Mexico as Mexicans are in the DPRK. Go crusade down there for illegal American immigrants. I’ll bail you out of a Mexican prison… if you’re still alive. Lawless thugs need to be JAILED. 1. Nearly 25% of Californians 38 million live below the poverty line. 2. California has more than 33% of the nation’s welfare recipients. 3. California is home to 12% of the nation’s population, but startlingly 21% of the nation’s homeless population. 4. The majority of California renters: Nearly 3 million households – pay more than 30% of their income toward rent. 5. Roughly – 1.5 million households pay more than 50% of their income toward rent. • Affordable housing continues to be out of the reach of most citizens. • California’s energy costs for transportation fuels and electricity continue to be the most expensive in the country. • The emissions crusade that began in 2006 has failed to reduce California’s 1 per cent contribution to the world’s greenhouse gases, all while cap-and-trade has raised $7 billion in fees from our citizens’ pocketbooks that are appropriated to more than 20 government pet projects. In the decade from 2006, California’s population has grown 1.077% to 38.8 million and we have less manufacturing jobs today than we had in 2006. • The mid ‘70s pioneering California Environmental Quality Act (CEQA) has created a nightmare for those seeking affordable, conveniently located housing, workplaces and shopping centers. • Unfunded pension liabilities. It’s unfortunate that future generations, unable to vote today, will bear the costs of many enacted entitlements and boondoggle projects. Even before those young folks can vote, our Golden State schools are on track to force substantial budgetary cutbacks on core education spending, as public schools around California are bracing for a crisis driven by skyrocketing worker pension costs that are expected to force districts to divert billions of dollars. We would appreciate our representatives to stop pursuing discretionary causes and pet projects and come to grips with the real problems facing all Californians. And this action on the heels of more fuel taxes and higher DMV costs imposed by the Democrats. Throw the bums out of office……………. no specials today…….I guess we will put up a few more feet of barbwire and get another playmate for Brutus, Baby and Vicious…..the best working pups out there. Just look at the cost of housing in California. Look at the high tax rate. You really have room for more people? His many people that are in this country illegally and hiding in basements and doing slave labor work for the “people that are protecting then ” how many have been threatened and told to so as they are told or they will be deported? Are the illegal immigrants really being g “protected” or are they being used and abused by the state? Hmmm………. Seems to me that our state leadership is willfully violating FEDERAL LAW by doing this. Maybe they need a reminder of the Swearing In OATH of office they took after they were elected……………. but I am sure most realize this action is strictly to get votes from the majority party in this state. Take a long drive on any freeway. You will lose your fillings from the road cupping, buckles, whatever. SF and surrounds, San Diego, LA are disgusting used up and blighted hovels with exploited struggling residents. Schools in these toilets are filthy and dangerous. So. As living/taxing costs rise and lifestyle declines….. Look for the “California Spring”. We must enforce all laws. The illegal aliens that are here must return home. Otherwise we are undermining our own laws. The USA is not breaking up the family. Members of these family’s are making bad choices, there are consequences!!  Trump is toggling between impeachment and selling out the morons who elected him—- DACA !!! He loves it now! Oh the humanity poor Doomera! What will you do? Limousine Liberals absolutely LOVE all that ultra-cheap domestic help (nannies, cooks, drivers, gardeners) not to mention all that slave labor for their factories, and with ‘sanctuary’ they also get to put on a nice little pair of white plastic angel wings! Win win! Republican Tom McClintock sponsored Ammendment 334 to make states a Sanctuary for marijuana. Vote him out.